Windows is going free, but not in the way everyone expected. In late February, screenshots of "Windows 8.1 with Bing" leaked to the web, said to be a free version of Windows stuffed with auxiliary services to recoup Microsoft's money in other ways. Well, Microsoft announced that Windows is indeed going free for at least some devices going forward—but not for desktop users. Windows 8.1 with Bing was never mentioned once at Wednesday's Build keynote. Instead, Microsoft will give away Windows licenses for use on phones and tablets with screen sizes below 9 inches, OS head Terry Myerson announced. You read that right: Manufacturers will no longer have to pay for Windows Phone licenses or licenses for the small-screen Windows tablets that Microsoft's been pushing in recent months. Microsoft's been struggling to gain market share in both the tablet and phone markets, rolled over by the all-consuming Android juggernaut. Giving away Windows for free could woo manufacturers to Microsoft's arms. That goes doubly so when you consider that Microsoft already receives licensing fees for every Android device shipped by most manufacturers, and that Google charges to include Google apps on an Android phone. Combined with the reduced hardware requirements of Windows Phone 8.1 and the Windows 8.1 updates coming soon, Microsoft appears well-positioned to drive device costs even lower, which will help spread the Windows ecosystem to valuable emerging markets—and help Microsoft launch a price war against Android. Mobile devices aren't the only hardware getting free Windows licenses, either. 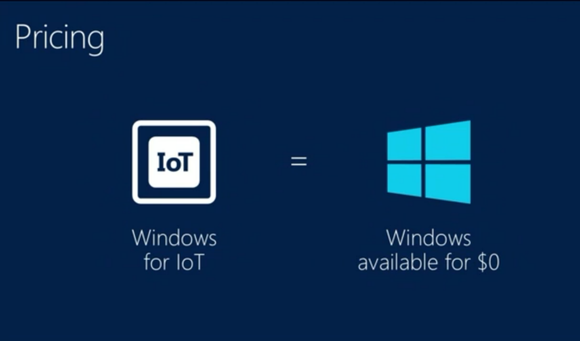 Microsoft announced "Windows on the Internet of Things" at Build. When that smart-device-focused OS eventually sees the light of day, it, too, will be provided at no cost. There's no doubt about it: Giving away Windows for free is a titanic shift for Microsoft, a company that made its fortune on software licensing. Don't expect Satya Nadella and crew to start giving away Windows PC licenses any time soon, however—though free updates for users in perpetuity would be a nice counterpunch to Apple's gratis OS X updates.